Don't start and go: As soon as you start the car, wait for rpm to drop to idle rpm (600-800 rpm) from 15-30 seconds in a newer car and 30-60 seconds in an older car before driving it off. This will help the car to circulate all fluids to necessary place in engine, gearbox, steering and brake boosters. Driving it immediately will starve some critical component for few seconds and may cause damage in the long run. Don't block the driver: While parking cars in the tight spot, leave more space on the driver side than on the passenger side. In parallel parking, move vehicle little front or back to avoid hitting side view mirror while opening. This will save a lot of scratches and bumps on both the cars. Don't drive on underinflated tires: Learn to check your tires with visual look every day and inflate them to owners manual tire pressure asap. When tire pressure is down, then the bottom tread of the tire is very less visible and worth a stop and checking. Most tires when underinflated screech while turning on cemented flooring like in building parking, fuel station etc.. So if you are not used to hearing screeching while turning then that can be the very first signal of low tire pressure. If in doubt, simply inflate to 30-32 psi in general for most of the cars in UAE. Don't hit the curb: While parking once your car hit the curb, move little away from the curb because leaving the car with tire hitting the curb will damage tire over time and may result in unusual bulge, cuts or leak resulting in wobbling ride. Don't ignore the leaks: Learn to check for leaks visually. 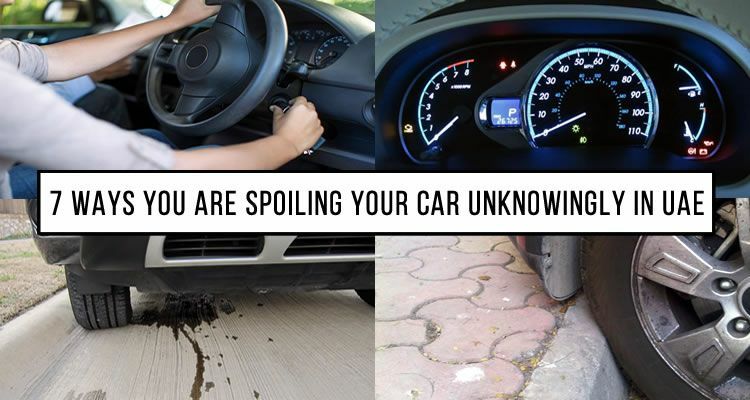 Every day when you walk towards your car just have a look under the car engine and sides to have any wet marking or oil drops or pool of oil. Minor few drops or stains are acceptable to some extent if they are occasional, but regular drops or pool of oil or any other fluid require an immediate check. Don't drive with weak brakes: When you hear screeching noise while braking then it is an indication that gets your brake pads and/or brake disc replaced. It's a first telltale sign of worn out braking system and you should not be ignoring it for a long time. Don't ignore the warning lights: You should never ignore any fault code light appearing on the dashboard be it for check engine light, SRS, ABS or battery icon. Warning lights in red color are critical ones and yellow are least critical but still, they all are warning light and trying to tell you to check or fix something in the car. I saw something on another site a couple of days ago, Reddit or 9GAG or something like that, I don’t remember. Some guy screwed rubber onto the kerb outside his house so he wouldn’t damage his wheels when parking. I felt like making an account just to tell him if you can’t park without hitting the kerb, you probably shouldn’t be driving. I see this every day. Some people have no spatial awareness and no idea of the size of their car. They will driver until they hit the kerb and use that as a feel for when to steer. It’s not just tyre damage. It knocks your wheels out of balance so the steering wheel vibrates when you drive. It also upsets your steering alignment so your car doesn’t drive straight when you let go of the wheel. Very good point added @Barry thanks for your additional valuable inputs. I see almost in every parking, tires are suffocated to the curb or kerb and then people complain that these tires were useless as they bulge out in less than a year when they don't know how to park. Even if you use the judgment of curb while parking (it's ok), move away few cms once you reach the end, then switching off car instantly. The second most killing thing I spot is more than 75% driver jump in the car and move away within 1-2 seconds while rolling they pull the seatbelt and wear their glasses. I am like do these basic steps first and let that poor car run for 30 seconds before you put the gear in drive. What i see taxi drivers doing often: slowly pushing the pedal for a few second till they reach desired speed, then letting it go, and so on, and so on. So it's like a constant pulsation of gas/no gas. Annoys the hell out of me and i really don't understand why they do it. Not sure if its harmful to the car, but i just don't see the point of doing this.